June 16, 2017 March 28, 2018 | Melissa Morriss-Olson, Ph.D.
Creative thinking skills are more important than ever if we are to deal with the vast and complex array of challenges facing many colleges and universities. In my last article I discussed the difficulty of creating and nurturing innovation within an academic organization. In my experience, the forces for preserving the status quo are especially powerful within academic organizations and are institutionalized in ways that make change very difficult. Moreover, those who are well positioned and authorized by role and formal authority to lead change are often weighed down with workloads and responsibilities that can kill the creative impulse. Perhaps it is no wonder that, according to a national study, the average tenure of a chief academic officer or provost is only 4.7 years, compared to the significantly longer 8.5 average tenure of all college presidents. According to this same study, the top frustrations for chief academic officers include lack of resources, difficulty cultivating leadership in others, curmudgeonly faculty, campus infighting, and unresponsive campus governance structures. Only 31% of respondents view 'leading change and fostering innovation' as job priorities; most of their time is spent managing bureaucratic processes and paperwork, and attending endless rounds of meetings. And yet, the evidence is clear: higher education is experiencing great change and disruption. One way or another, our institutions are going to shift, either from inside or outside. Creative thinking skills are more important than ever if we are to deal with the vast and complex array of challenges facing many colleges and universities and maintain some control over our own destiny. 1. Make creative thinking a habit. Many of us believe that creativity is something you either have or don't. And yet, the research suggests that creative thinking is no different than any other behavior that we might want to change or develop. Thomas Edison’s creative thinking habits provide a great example of how creativity can be cultivated by anyone in nearly any industry. As illustrated by his notebooks which span six decades, the keys to becoming a habitual creative thinker include: generate as many idea as possible, discipline yourself to ask ‘why’ and ‘why not?’, keep an idea journal, and adapt an exploratory frame of mind. Just as with other common habits that form because of repetition and intention, creativity can become one's default mode. The key is to make a commitment to work at it, to challenge yourself, and to implement daily practices that will be habit-forming over time. For example, I now keep a small notepad in my purse so that I can record ideas immediately whenever and wherever they come. A friend keeps an idea notebook on her desk and has disciplined herself to take five minutes at the end of each day and jot down all ideas—good and bad—that emerged throughout that day. Award-winning producer of such movie and television hits as A Beautiful Mind, Apollo 13, 24, Empire, and Frost/Nixon, Brian Grazer attributes his success in the film industry to the power of curiosity and says it is something he has worked at his entire life. In his recent book he shares his belief that every conversation is an opportunity for generating game-changing ideas. He has disciplined himself to ask 'leading' questions and to be alert to possibilities that might otherwise fly right by. Like Edison, Grazer has learned to remain open-minded and detached from personal opinions and assumptions, to be present, and to expect to be surprised. Some of our best new program ideas at Bay Path have resulted from Grazer-esque 'curiosity conversations.' Several years ago, during an end of year celebration, I learned from one of our criminal justice and legal studies double majors about her plans to enroll in a cybersecurity master's program at a university in the region. I asked several 'leading' questions about her decision to pursue this career pathway and eventually concluded that there was something to this. The result of this conversation? Bay Path University is now one of the leading universities in the country in the education of cybersecurity professionals at the undergraduate and graduate levels. 3. Formalize opportunities for idea creation. One of my colleagues at another institution has a standing agenda item for her weekly deans' meeting labeled 'crazy ideas.' Each week, someone is assigned to share an outlandish idea with her team, with the only rule being 'there is no bad idea.' Invariably, the ensuing discussions lead to breakthrough thinking, and more than a few new programs have been generated because of someone's crazy idea. Alternatively, you might ask someone to restate a problem from different perspectives or turn an issue upside down to consider an implausible scenario. The point here is that new ideas typically don't just emerge on their own. And the higher ed environment is one where it is always easier to consider why something cannot be done versus considering what it might take to do something differently. There are many tools that can be used to spark creative thinking and generate new ideas in group settings, so that your entire group forms the habit of creative thinking. The key is to formalize the use of these tools so that creative thinking becomes an important and expected part of your ongoing meetings. When asked for his definition of creativity, Steve Jobs offered similar thoughts: "Creativity is just connecting things. When you ask creative people how they did something, they feel a little guilty because they didn't really do it, they just saw something." A fellow provost at a neighboring institution keeps a large white board in her office to capture ideas that are generated at her monthly council meetings. She structures time each month for team members to review the sticky notes and see what connections or patterns they can find. According to this very wise provost, "some of their best ideas have been right in front of them on the board but invisible until someone connected the dots between two or three sticky notes." 5. Get out of the office. For most of us, very few if any new ideas are generated while sitting at our desks processing paperwork. 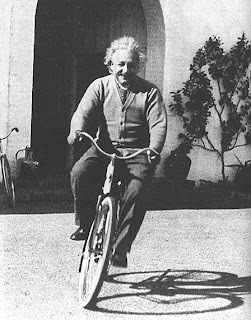 When asked how he came up with the theory of relativity, Albert Einstein said, "I thought of it while riding my bicycle." Those who exercise regularly can attest to the way our thinking changes when we are in the aerobic state of flow. Ideas emerge as if by magic, and the filters that sometimes keep good ideas out are relaxed. A friend of mine likes to hold walking meetings and claims that the outcome of these meetings is invariably more positive and productive than meetings held in his office. Given that an increasing body of research confirms that exercise can in fact increase creativity, I think my friend is on to something. Develop the habit of getting out of your office at least once each day. Schedule in time each day that gives you opportunity for those 'curiosity conversations' with students or others on campus. A faculty member I know who was struggling to get her latest writing project going began spending time each week at our local Starbucks. She now credits that time spent soaking up the smell of coffee and the conversations all around her as the impetus she needed to get the creative juices going. 6. Embrace fear and failure. According to psychology professor and creativity researcher Dr. Keith Simonton, the number of creative breakthroughs one has is directly linked to the quantity of effort and a tenacious and persistent attitude. From his research on individuals across many occupational fields, Simonton found that creative individuals simply generated more ideas—including many that were dead-ends—and demonstrated extraordinary resilience and an acceptance of failure as simply a part of the process. In her 2008 Harvard commencement speech, author J.K. Rowling extolled the benefits of repeated rejection and failure for igniting her imagination, eventually culminating in the Harry Potter series. In Elizabeth Gilbert's latest book, Big Magic: Creative living beyond fear, she talks about the positive and empowering tone set by the boss of her publishing house, who opened meetings with the following words: "You will never get in trouble in this organization for failing, as long as you fail in increasingly interesting ways." Being creative is like throwing spaghetti against a wall and seeing what sticks. It takes courage as leaders—especially within academic organizations—to squelch the urge for the right answer and instead create a culture that values and encourages prolific and uninhibited spaghetti throwing. In the same article I quoted above under Tip #4, Steve Jobs suggests that the best dot-connectors are those who have had a variety of diverse experiences: "A lot of people in our industry haven't had very diverse experiences. So they don’t have enough dots to connect, and they end up with very linear solutions without a broad perspective on the problem. The broader one's understanding of the human experience, the better design we will have." Perhaps it is not surprising that travel abroad has been found to increase college students' creative thinking skills. The mere act of getting out of one's comfort zone to experience new sights and sounds can be transformational to one's mindset. The same 'mix-it-up' concept applies when you bring the outside in to your everyday work processes and experiences. For example, bringing in external professional experts who have differing points of view to work alongside faculty on academic program initiatives can result in new ways of thinking about how education is being delivered. And research clearly demonstrates that better, more creative solutions emerge from diverse groups of individuals. So the more we diversify our faculty and staff, the better our odds for creating cultures where creative thinking is likely to emerge. I look forward to sharing the rest of this series with you.